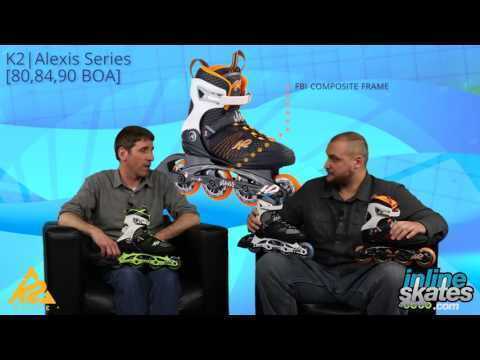 The K2 Alexis Boa Inline Skates offer the stability, comfort, fit and performance you want in a fitness skate. You want it? This skate's got it! Starting with the Boa Lacing System, the Alexis offers you the ease of dialing in your perfect fit and feel while also allowing for easy adjustments on the fly. Its quick dialing makes entry and exit a breeze. Built on DC Aluminum Frame, you'll have incredible energy transmission and stability at any speed. Your foot will be wrapped in a Stability Plus Cuff which gives you awesome support and comfort in a lightweight boot. Lateral Reinforcement and Arch Support ensures you have all the support necessary to maximize your workout. Skip the gym and get a real full body workout with the light impact sport of skating. 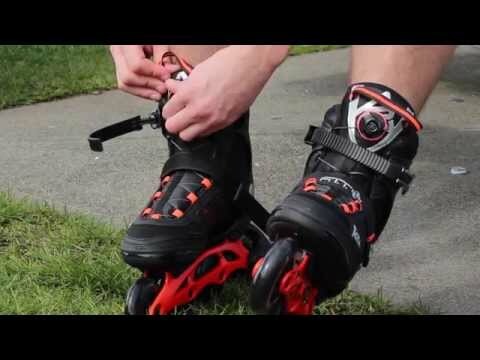 Place your feet inside these K2 Alexis Boa Inline Skates and you'll take off and enjoy being outdoors while you work up a sweat and have a lot of fun. Had these for 4 years. Bought them for a Christmas present, My sister has no complaints about these skates. She never owned a pair and she’s very satisfied, especially with the BOA system. Very convenient to tighten and loosen up quickly. Replaced an older pair of K2 inline skates and these are just as I expected....AWESOME! Q: Hello, I understand that these skates are the 2016 model, but I was wondering if you had any size 7 or 7.5. If not, what is the current model of these? A: No, the sizes we have listed are the sizes we have left. 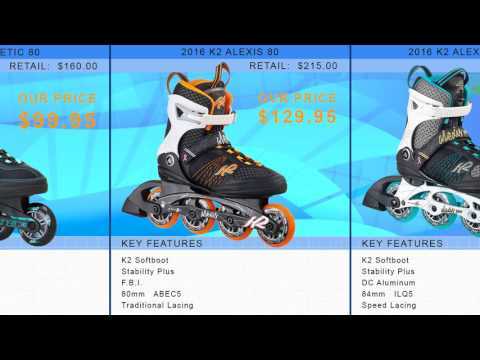 There is a current 2019 model of this skate currently available for preorder in both size 7 and 7.5, to view please search in the top site search bar " K2 Alexis 84 Boa "
Q: Hello! I loved this color! But I'm looking for a size 8. Can you help me? Thanks! A: Unfortunately we don't have that size left in stock at this time, and this skate is from model year 2016 so it's unlikely that we will receive more stock. We do have the current version of this skate in stock in your size but obviously the colorway has been updated. Q: I just barely learned to skate at the roller rink (didn't fall, yay, but my main frustration using the rentals was that it was hard to maintain speed so I kept leaning back on accident) and I used inline skates and liked it. I really want to skate to exercise so I was looking at these but am a little intimidated by the intermediate level label. I'm at a toss up between these and the 2018 Kinetic 80s. Any advice? A: it really depends on how athletic you are and how quick you think you will learn. The Alexis offers features you can grow into with the 84mm wheels, ILQ7 bearing and the aluminum frame. The Kinetic would be a great learning skate but if you skate often and learn quickly you will soon find yourself happier with the features found on the Alexis. Either one will be a leap better than what is offered in most all rental shops. Q: The sizes left over are 4.0 and 6.0?? So.... someone who is the size of a child? A: Currently we have size 4, 6, and 7 left in stock in this skate. This is a 2016 model skate which is why we do not have a full size run in stock. We do have this skate in the previous model available from size 6 to size 11. 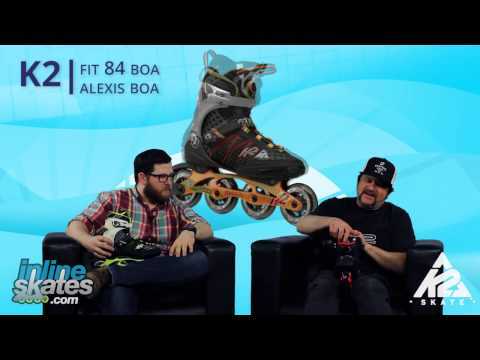 Q: In August 2015 I purchased the Alexis BOA women's skate from your company. I love them. I noticed last year they were slowing down, even after rotating the wheels regularly as needed. I suspect I need to do some maintenance on the bearings. I put on about 130 - 150 miles a season here in MN. I've had them 2 seasons. The type of maintenance depends on the type of bearings. The bearing maintenance isn't addressed in the manual that came with the skates. I've contacted K2 & they haven't responded. I would appreciate any advice and assistance you could please. provide. Thank you. A: Definitely just buy a new set of wheels. Be sure the set comes with the bearings. guide; mm= the size. The higher the number, the fast they go. Same for the number associated with bearings. Durometer= softness. The lower the number the softer the wheel. While a soft wheel may not go as fast and also may wear down more quickly, I personally prefer a softer wheel because they will gripped the road better and roll over debirs more easily than harder wheels. A: The ILQ7 bearings on the Alexis Boa is a serviceable bearing and can be cleaned and oiled, then put back together. You will have to remove the outer shell of the bearing and then soak them in a solution (search the site for turbo wash) then let them dry and give each one a squirt of oil (search Super oil) and put it all back together. This will give you a great like new performance. For a video of the process please copy and paste this link into your browser. https://www.youtube.com/watch?v=0IQWZ7QX0oY Hope this helps! I was lazy this season and just replaced my wheels and bearings with new. Q: I purchased the K2 Alexis Boa skates two years ago and their the best pair I've bought yet. I skate in the summer about 6 miles, 3 times a week, on a paved road (fairly smooth); as well as in the winter with my kids at the skate center. My wheels & brake are starting to wear and may need replacement before I get back on the road this summer. I think I'm going to upgrade to the 90mm wheel ~ is there a particular 90mm wheel you'd recommend for an experienced blader? Existing bearings should be OK? Can I also purchase a replacement brake (can it be replaced)? A: Great questions. For wheels I'd recommend going with the Rollerblade Hydrogen, these are solid wheels rolling smooth and lasting a long time. I just replaced my older hydrogen wheels with a new set and I am very pleased. Search for "Rollerblade Hydrogen 90mm" and you will see these wheels. There are 2 different Hydrogen wheels in stock currently, they are the exact same but 2 different colors is all. You can absolutely replace the brake as well and we have them in stock, search "K2 Brake" and you will see the brake, it's $12.95 and comes with a new screw too. The brake fits all K2 skates from 1998 to current year so no need to worry about it fitting. Hope this helps, and happy skating! Q: My feet is almost 25.5 cm, it translates whether to an 8.5 or to a 9 skate size. These skates come only in full sizes, which ones should I get? The 8 because it will break in half a size or the 9 because it may be my true shoe size?? I always juggle between these 2 sizes, my feet is slim though. A: You're best bet is to go with the size 8.5 in a skate where this size is available. We have a limited size run in this skate as it is from a past year. We do currently have this same Alexis Boa available in the current year in the size 8.5 for not that much more. Search "Alexis Boa" in the top site search bar and you will see them show up in the search. If you had to choose between the 8 or 9 I'd personally go with the 8 and go with a tight performance fit but since there are many skates offered in a size 8.5 you don't need to choose. Q: Would these be a good choice for an almost beginner at inline skating?? I want to start inline skating recreationally but also want to use my skates to exercise. Would it be so bad if I started with 84 mm wheels? I'm afraid to spend the money and not be able to use them at all because of my skills. I'm 21 years old. A: In today's inline skate world 84mm is no longer that large of a wheel, but it is much larger than what used to come on skates. If you currently know how to skate and hold some sort of athletic ability you should have absolutely no issue with the 84mm wheels. Simply start out slow and on even terrain for the best chance at success. 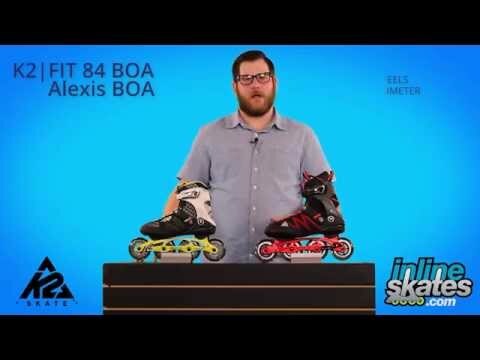 Q: I have the K2 Alexis Boa skates (Previously I owned inline skates with a LOT smaller wheel). These seem like the wheels turn so much harder. Is it due to the wheels being so much bigger? A: A skate with bigger wheels can take some getting used to, and at first can be a bit harder to turn. You will get used to it, it will just take some time. It took me a couple times skating to get used to going from 80mm to 90mm but once I got there I was very happy with the additional smoothness and speed with the larger wheel. If you are absolutely fed up with the large wheels you can always downsize the wheels, I wouldn't go any smaller than 76mm, but in all honesty after a couple times skating with the larger wheels I bet you will be used to it and carving turns like a well tuned sports car! Best of luck and happy skating! Q: I recently bought these and my wire broke already.. can I buy a new wiring system? A: Contact customer service at 888.421.6836 and they will get you squared away with what you need.